Brussels, 22 November 2005: EU Development Policy turns a blind eye to child labour while Commissioner Michel makes a promise to never forget children in his efforts. 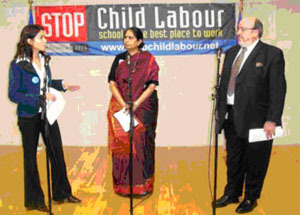 On November 22, 2005, the day the Council of the European Union adopted its new Development Policy, Commissioner Louis Michel received 170 000 signatures, organized by the Campaign Stop Child Labour – School is the best place to work, urging the Commission to step-up its efforts to combat child labour. “This could have been a day of celebration for us”, stated Indian child labour activist Shantha Sinha, Secretary Trustee of the M Venkatarangaiya Foundation. “With your strong commitments to the Millennium Development Goals, Commissioner Michel, we expected the policy to be strongly geared towards achieving them. However, the new policy does not pay due attention to one of the most severe obstacles to achieving Goal 2 and 3 on education: child labour.” She urged the Commissioner to recognize that, “If not all forms of child labour are eradicated, all efforts to achieve universal education will be in vain.” Prof. Ahmed Bouziane from the teachers union SNE in Morocco also confirmed the urgency of this message for his country. When receiving the petition Commissioner Michel assured the audience of his personal commitment to children’s rights, “I promise you I will never forget children in my struggle”. Referring to the adoption of the Development Policy and the EU Africa Strategy, Michel stated that, “Combating child labour is already at the heart of the European Community’s policies for development” and promised that policies and measures to resolve this problem will also be launched. “Be sure that we will tackle the issue of child labour”, he vowed. Referring to the issue of budget support, Commissioner Michel stated that the European Commission would never give budget support to a country that is not serious about combating child labour. The Commissioner closed the press conference with the words “You can count on me.” With important documents to be finalized such as the Development Cooperation and Economic Cooperation Instrument, the Campaign is eagerly waiting for the Commissioner’s promises to materialize. together with The Indian Committee of The Netherlands, Dutch Federation of Trade Unions and the Dutch Teachers Union.